The Great Knaresborough Bed Race is something different: it is part fancy dress pageant and part gruelling time trial over a 2.4 mile course, ending with a swim through the icy waters of the River Nidd. First staged in 1966, Bed Race has spawned other similar events in the USA, Germany, New Zealand and elsewhere in the UK. 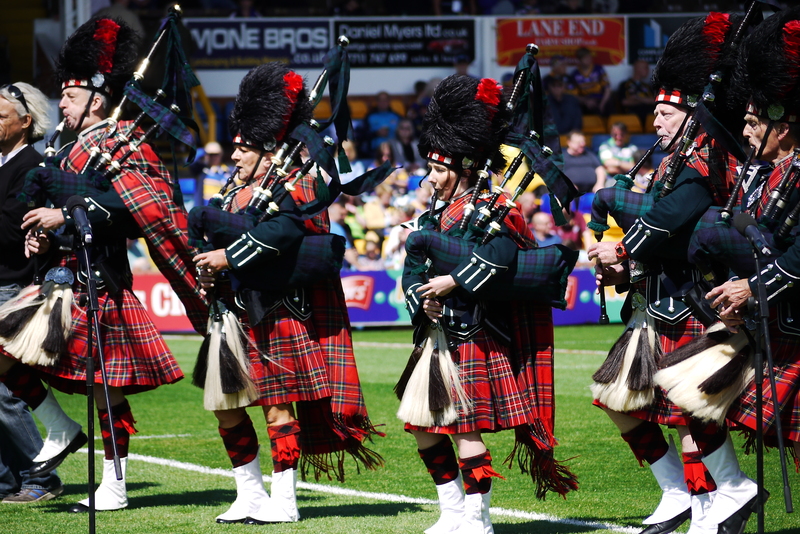 It is great fun, an amazing spectacle and, being held in Yorkshire, a truly serious competitive effort, pitting teams against their fiercest rivals, their erstwhile friends or even against themselves. Whatever happens, it is never good enough and each vows to be back to do better next year! Each year Bed Race features 90 teams of six runners and a passenger – that’s 630 people sweating around the course. In addition, scores of local handymen and dress-makers get drafted in to decorate the beds and adorn the runners. Hundreds of people parade with the teams and in marching bands and dance groups. And hundreds more turn out as volunteers to marshal the event on the day. It is truly a whole-town effort with runners today being the grandchildren of those who turned out in the 1960s. The teams gather at Knaresborough Castle on the morning of bed race day to be judged for the ‘Best Dressed Team’ accolade. So good have the designs become that in addition to first, second and third positions, others win special commendations for their endeavours. 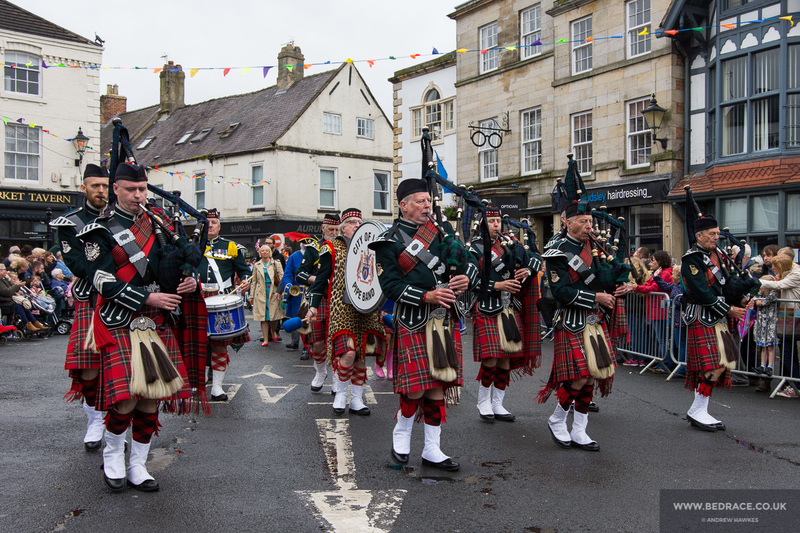 From 1 pm, led by the winning decorated team, the teams parade in all their finery through the medieval streets of Knaresborough to Conyngham Hall. Each team is allowed up to 20 supporters to parade with them also wearing in fancy dress, and this is often the first Bed Race experience for many youngsters. Making up the parade are marching bands, troubadours, dance groups and others. Awards are made for the Most Entertaining Teams. At Conyngham Hall Field the decorations are stripped and the teams prepare for the race itself. The Knaresborough Lions make an estimation of who is fittest, based on past year results, and the teams go off in race order with the fastest first in gaps of about 10 seconds. The course is wonderful and, apart from one stretch down an almost vertical drop now deemed too dangerous, follows exactly the same course as that in 1966. The course is challenging and hard. It takes the teams up a steep grassy bank and through parkland, along the scenic Waterside. Then they pass through the dramatic Nidd Gorge, up the steep Castle Ings, around the cobbled stones of the Marketplace, down the High Street and Bond End, and across High Bridge. The last stretch is on the rough ground of McIntosh Park before the notorious 20-yard swim across the fast-flowing Nidd. There is no doubt that the real hero of Bed Race is the dramatic topography of Knaresborough itself. The fastest teams do the course in around 14-minutes, sometimes quicker, and the slowest come in well under 30 minutes. Runners have to fit, fanatical and frankly a bit mad, while the passengers have to be light, be good swimmers and be able to shout loudly! Being North Yorkshire, the weather can provide an extra challenge. Though June is considered the flaming month, in our northerly climes that doesn’t mean the outlook is either warm or dry. Twice the river crossing has had to be abandoned – in 1972 and 1998 – when torrential rain swelled the Nidd into flood. But neither hell-nor-high water can dampen the spirits of bed racers and spectators and the event has never been called off. In fact, normally the weather gods are usually kind to the event and there is a legend that the phenomenon, known locally as the Knaresborough Shadow, comes out like a giant umbrella to protect the event. This certainly seemed to be the case in 2012, when all around were being lashed in what was one of Britain’s wettest summers on record, while Knaresborough basked in thin, watery but welcomed sunshine. 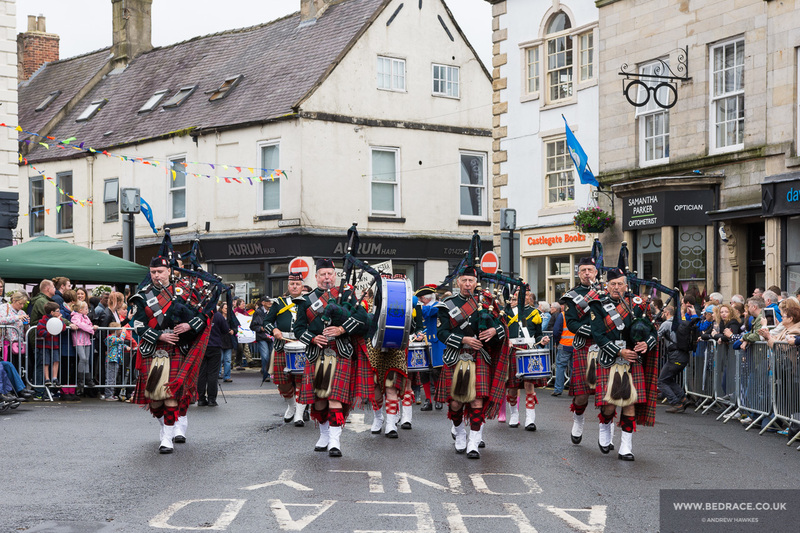 The event was born out of the enthusiasm of the newly-formed Knaresborough Round Table in 1966, an organisation looking for a major charity fund-raising push. They came up with the idea of a time-trial in which teams would follow a pre-determined course pushing beds around the town. It could have been a chariot race, a tug-o-war, a raft race on the river, a soap box derby or any of a hundred other ideas. But they plumped for a bed race, and somehow that unique combination with Knaresborough’s almost perpendicular climbs and cobbled streets, the swim across the Nidd and the fancy dress pageant have worked together to make this such a huge and successful community event. 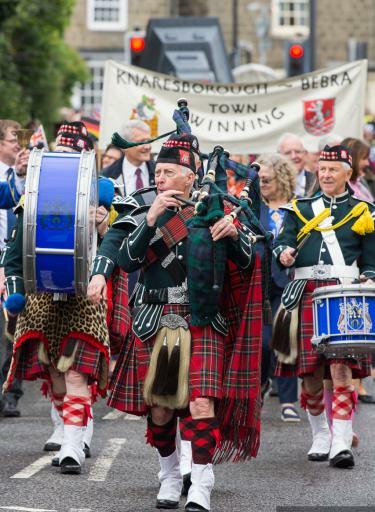 Due to falling membership, the Round Table cast around for another organisation to help and the Knaresborough Lions Club became joint-arrangers in 1993, taking over the whole event from 1998. Like their predecessors, the Lions are a bunch of volunteers who stage the event for charity. Funds are raised by the Lions, by the teams themselves for their own good causes and by other charities who get involved on the day. It is thought that the total raised is between £80,000 and £100,000. Not a bad return on a must-see event! For race day times please see the programme. For information about this years race including parking and road closures around Knaresborough please visit the race day information page.